Scotland has declared its enduring relationship with Europe in a heartfelt message to demonstrate that Scotland is open on the original date that the UK had planned to leave the EU. The latest chapter in the global marketing campaign, Scotland Is Now, launched today (29 March 2019) with a simple, powerful message: “Europe, let’s continue our love affair”. The launch deliberately coincides with the UK Government’s original ‘Brexit day’ and is designed to tell the continent that Scotland remains an open and welcoming nation. Specifically targeted at key European markets - France, Germany and Spain – where Brexit may be having a negative impact on investment and tourism to Scotland - the campaign builds on existing relationships and reinforces Scotland’s reputation as a world-class place for people to live, work, visit, study and do business. Using a mix of new creative online content and advertising, the campaign will be rolled out online and in key locations including Munich and Paris airports and in major international titles such as Le Monde, El Pais, and Der Spiegel. Scotland’s First Minister Nicola Sturgeon said: “In the face of uncertainty over the UK’s plans to leave the EU this campaign sends a strong message that Scotland continues to be a welcoming and outward looking country that will always be open for business. “We cannot sit back and allow Brexit to damage investment and tourism. It is right that we promote Scotland across Europe and there is no better time to remind our European neighbours of our values, our talents, and our friendship than right now. Director of Brand Scotland, Cat Leaver, said: “Scotland is Now is an exciting collaborative campaign which leverages our rich mix of people, places and experiences to share Scotland’s story with the world. “This latest phase of the campaign recognises that as Brexit uncertainty continues, Scotland’s love affair with Europe absolutely endures. Currently, Europe provides six out of Scotland’s ten key tourism markets. In 2017, 1.6 million EU residents visited Scotland, generating £956 million for our economy. And, at home, the contribution of EU workers to Scotland’s tourism industry should be celebrated, with 21,000 workers (around 11.6%) employed in the sector during 2017/18. Trade and investment with Europe is equally as critical with around 32% of Scotland’s inward investment projects having come from the continent. In addition, nine of the top ten export destinations are in Europe, accounting for a significant £13.2 billion of trade for Scotland. And with population growth in Scotland projected to be amongst the lowest across comparator European countries, it is widely recognised that net in-migration of EU citizens coming to live and work in Scotland is critical to the future of the country’s demography, economy and society. Bringing together VisitScotland, Scottish Enterprise, Highlands and Islands Enterprise, Scottish Government and Universities Scotland for the first time with a single, bold narrative for Scotland, the Scotland Is Now initiative was launched in April 2018. In its first year, the campaign aimed to grow awareness of the nation targeting the key markets of New York, San Francisco and London. Within its first nine months, the campaign delivered in excess of 127 million views of its videos, attracted over 1000 uses of the #ScotlandIsNow hashtag every day, reached thousands of businesses worldwide and drove increased referrals to all partner channels. This aspect of the campaign is funded by Visit Scotland and Scottish Enterprise. Campaign assets are available from the Scotland is Now Brand Campaign Toolkit. Following an industry consultation, the Themed Years will now take place every second year to enable more time for planning and opportunities for collaboration. 2020 has been designated as a year in which Scotland’s Coasts and Waters will be showcased and celebrated with a programme of activity designed to support the nation’s tourism and events sectors. 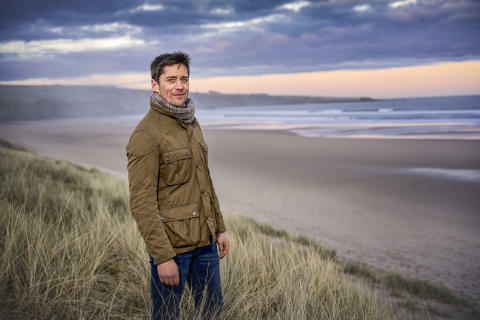 The year, led by VisitScotland will sustain and build upon the momentum of Scotland’s preceding Themed Years to spotlight, celebrate and promote opportunities to experience and enjoy Scotland’s unrivalled Coasts and Waters, encouraging responsible engagement and participation from the people of Scotland and our visitors. A year-long programme of events, activities and ideas will shine a spotlight on the impact our waters have had on Scotland, from the formation of beautiful natural features to the creation of our national drink – whisky. 2022 will be the Year of Scotland’s Stories - a celebration of our rich literature, film, oral traditions and myths and legends. Global campaign takes Scotland to the world.